Siena is likely Italy's loveliest medieval city, and a trip worth making even if you are in Tuscany for just a few days. Siena's heart is its central piazza known as Il Campo, known worldwide for the famous Palio run here, a horse race run around the piazza two times every summer. Movie audiences worldwide can see Siena and the Palio in the James Bond movie, Quantum of Solace. The Campo is dominated by the red Palazzo Pubblico and its tower, Torre del Mangia. Along with the Duomo of Siena, the Palazzo Pubblico was also built during the same period of rule by the Council of Nine. The civic palace, built between 1297 and 1310, still houses the city's municipal offices much like Palazzo Vecchio in Florence. Its internal courtyard has entrances to the Torre del Mangia and to the Civic Museum. If you feel energetic, a climb up the over 500 steps will reward you with a wonderful view of Siena and its surroundings. The Museum, on the other hand, offers some of the greatest of Sienese paintings. The Sala del Concistoro houses one of Domenico Beccafumi's best works, ceiling frescoes of allegories on the virtues of Siena's medieval government. But it is the Sala del Mappamondo and the Sale della Pace that hold the palaces's highlights: Simone Martini's huge Maestà and Equestrian Portrait of Guidoriccio da Fogliano and Ambrogio Lorenzetti's Allegories of Good and Bad Government, once considered the most important cycle of secular paintings of the Middle Ages. Magical & enticing, even the most active visitor will want to take a few extra minutes to bask in the Tuscan sun, watch the shadow of the tower move across the square like the hand of a large clock and soak in the special atmosphere of Piazza del Campo. Admire it from below or climb it to the top, this is one stop you don't want to miss in Siena. The iconic tower is a beacon for those who are in the city or travelling in the countryside. Do you want to see more than Piazza del Campo and the Duomo in Siena? Here are ideas for a few walking trips which will take you around the beautiful city of Siena, offering great views of the city and surrounding countryside and taking to you a few other sights off the main tourist beaten path. 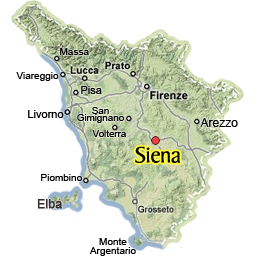 Useful information about Siena: how to get there with or without a car, where to park and what do to once you got there, included helpful tips for most enjoying this marvellous city. Quality, romantic, ambiance or just simple home cooking? Whatever you are looking for in a restaurant, it always helps to have a local’s point of view on what is available in Siena. The first time we went into the cathedral in Siena, we weren't expecting all the black and white. Then you step into the Piccolomini Library and discover where all the colors are! It is a stupendous discovery we highly recommend you include on your itinerary in Siena. The Civic Museum of Siena conserves many interesting frescoes and is a must-see during your visit to the city. Visit the Crypt, the Baptistery and the Museum dell’Opera to get a full history of the Cathedral in Siena and complete your visit to Siena's main religious sites. The complex of Santa Maria della Scala stands in front of the Duomo, the ancient structure welcoming pilgrims to the city on their way to Rome. Today, it is a monumental building hosting artwork of extraordinary beauty of both artistic and historical importance. Stay in Siena this summer to enjoy the evening, completely NEW 3D video show on the side of the unfinished new cathedral next to the Duomo. A journey through centuries of history, traditions and values of the people of Siena that placed the medieval city at the center of the civilized world. Are you going to Siena to see the Palio? Read these insider's tips on how to avoid the most common mistakes and enjoy this unique experience! Are you on holiday with your children? Here are ideas for places where the whole family can enjoy and take a break from the tourist attractions while you're in Siena. Visit the village of Radicondoli in the area of metalliferous hills to enjoy the peaceful atmosphere of a typical Tuscan hilltop village and to know about geothermal energy of the area. The best of the English narrative about Siena and the Palio tradition, for going deeper into the essence of this fascinating Tuscan city: no book however, can be compared to a real visit to the city, for seeing its artistic treasures in person!